The Indonesian government’s long and difficult task of developing Papua just got a lot harder after Free Papua Movement (OPM) rebels slaughtered at least 16  construction workers who were building a 4,320-kilometre highway that will bring migrants into the once-remote Central Highlands in greater numbers than ever before. It is thought to be the bloodiest single incident in Papua since the controversial UN-administered 1969 Act of Free Choice made the former Dutch-controlled territory a formal part of Indonesia, sparking an independence struggle that continues today. The OPM’s armed wing, the West Papua National Liberation Army, claimed responsibility for the massacre, which suggests that the decades-long conflict may have entered a dangerous new stage despite the rebels having very few modern firearms. Indonesian President Joko Widodo made it clear  that the attack wouldn’t discourage the government from finishing the long-delayed Trans-Papua Highway by the end of next year. ‘This only makes us more determined to continue our great duty to develop Papua’, he said. With the highway and Jakarta’s new mass rapid transit system as centrepieces, Widodo has presided over arguably the biggest infrastructure construction boom in the nation’s history, using it to press his claims for a second term when Indonesians go to the polls next April. The OPM wants to stop the road, which cuts a meandering path through challenging terrain from the coastal city of Sorong in the western Bird’s Head region across the Central Highlands to Merauke on the southeast coast bordering Papua New Guinea. In March last year, separatist gunmen upped the ante by ambushing and killing four construction workers on a section of the highway in the rugged district of Puncak Jaya, 120 kilometres northwest of Wamena, the quasi-highland capital in the Balian Valley. While the highway will sharply reduce the costs of fuel and other basic needs in Papua’s interior, local leaders worry about the social impact, saying the tribes aren’t prepared for the influx of migrants, who now outnumber native Papuans by as much as 60:40 across the once-roadless region. The combined population of Papua and West Papua provinces is estimated at 3.6 million, 1.7 million of whom are listed as indigenous. Many of them are highland tribespeople living in the 10 districts that straddle the road as it winds along the region’s mountainous spine. Still fresh in many minds is the violence which erupted in 2015 in Tolikara, north of Wamena, after local church leaders forbade Muslims from celebrating the end of the Ramadan fasting month. Although only one person died, it was a taste of what a toxic mix of community tensions and poor governance can do. That discord hasn’t been helped by better-educated migrants getting most of the senior positions in the creation of new administrative regions, a process known as pemakaran which is more common in Papua than anywhere else in Indonesia. Since 2000, the number of kabupaten, or districts, alone has grown from nine to 29 in Papua province and from three to 13 in West Papua, all aimed at satisfying local political demands and getting access to funding rather than improving the quality of administration. The 1 December massacre in the central mountain district of Nguda follows a series of pin-prick attacks dating back to local government elections last June and has led to fears of the military and the police overreacting, as they have done in the past. Ironically, the death toll is the worst since a deranged Indonesian special forces lieutenant, armed with an assault rifle, killed 11 soldiers and five civilians in an airport hangar in Timika, the largest town on Papua’s south coast in 1996. He died in prison years later. Employed by a state-owned construction company, the workers were building a bridge in Nduga, a long-time OPM hotspot lying northeast of Freeport, Indonesia’s heavily guarded Grasberg mining operation which has been a favoured rebel target in the past. The killings were reportedly triggered by one of the workers filming a pro-independence flag-raising ceremony, an activity banned by the government that has often led to mass arrests and a violent security crackdown. The OPM claims the video-cameraman was in fact a government intelligence agent, one of a network of paid informers across Papua. There are conflicting reports about what exactly transpired in the lead-up to the massacre, with even the initial casualty  estimates  varying between 24 and 31. According to one unverified social media account, the gun-toting rebels rounded up the workers at their construction camp, tied their hands and then marched them to the Karunggame River, where they were shot or hacked to death. In a separate incident on 3 December, one soldier died when the same assailants struck a nearby territorial battalion security post, forcing the small unit there to withdraw until the arrival of helicopter-borne reinforcements from Wamena. Nduga and neighbouring Puncak Jaya were both the scene of election-related violence, including two separate incidents when rebel snipers opened fire on passenger aircraft readying for take-off at Kenyam, the Nduga district capital. Two pilots were wounded. Changing demographics and efforts to improve the welfare of native Papuans have always been controversial, given the legacy of former president Suharto’s now-defunct transmigration program, under which 750,000 migrants settled mostly in western Papua. Since then, unassisted migrants from Java, Sulawesi and neighbouring islands have followed in growing numbers, settling in West Papua’s coastal towns, the Papua province capital of Jayapura, and around the boom town of Timika, which also serves as Freeport’s logistics base. 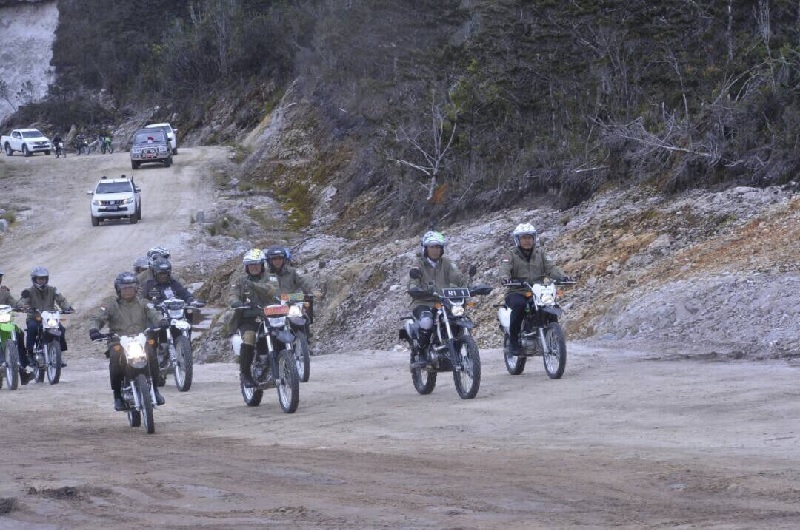 Widodo has visited Papua six times since taking office in 2014, more than any other president, and was pictured earlier in the year touring part of the Trans-Papua road on a motorcycle. But he has so far failed to follow through on his commitment to a sustained peace dialogue. With former military commander General Moeldoko taking over as the president’s chief of staff last January, even efforts at a limited dialogue focused on health, education and the environment have gone nowhere. There has always been a high level of mistrust felt among defence and home affairs officials, who believe that any talks with indigenous Papuan leaders will inevitably lead to demands for independence. If any pretext was needed, the massacre will only harden that stance. John McBeth is a Jakarta-based correspondent. Image courtesy of Joko Widodo on Twitter.